Ditched 20 miles from English coast. Operation MUSJIDE, Belgium. (Flight Sergeant) Warrant Officer 513278, Royal Air Force. Died Wednesday 28th January 1942. Commemorated on RUNNYMEDE MEMORIAL, Surrey. Panel 72. Wing Commander 90447, Royal Air Force (Aux. Air Force). Died Wednesday 28th January 1942. Age 41. Son of Lionel D. and Mabel P. Benham, of Marylebone, London. Commemorated on RUNNYMEDE MEMORIAL, Surrey. Panel 64. 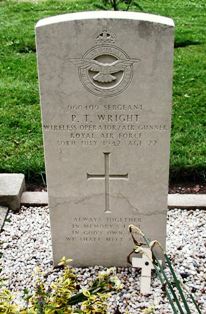 (Flight) Sergeant 634328, Royal Air Force. Died Wednesday 28th January 1942. Age 20. Son of Richard and Elsie Brittain, of Gateshead, Co. Durham. Commemorated on RUNNYMEDE MEMORIAL, Surrey. Panel 73. (Flight) Sergeant 1001635, Royal Air Force Volunteer Reserve. Died Wednesday 28th January 1942. Age 21. Son of Arthur and Mary Alice Gold, of Farington, Lancashire. Commemorated on RUNNYMEDE MEMORIAL, Surrey. Panel 74. (Flight) Sergeant 1151000, Royal Air Force Volunteer Reserve. Pilot. Died Wednesday 28th January 1942. Age 20. Son of Evan and Mary Jones, of Nantoer, Newtown, Montgomeryshire. Commemorated on RUNNYMEDE MEMORIAL, Surrey. Panel 75. Sergeant 543358, Royal Air Force. Died Wednesday 28th January 1942. Age 21. Son of Francis William and Elsie Smith, of Alcester. Buried ALCESTER BURIAL GROUND, Warwickshire. Grave 2355. Crashed into the sea at Dan Helder operation WATERCRESS, Holland. Sergeant 526918, Royal Air Force. Died Friday 27th March 1942. Age 26. Son of Robert Beadnell Evans and Ursula Ann Evans, of Birkenhead, Cheshire. Commemorated on RUNNYMEDE MEMORIAL, Surrey. Panel 82. Pilot Officer 105182, Royal Air Force Volunteer Reserve. Died Friday 27th March 1942. Age 26. Son of Robert Harry and Amy Franklin; husband of Olive Ethel Frances Franklin, of Farnborough, Hampshire. Commemorated RUNNYMEDE MEMORIAL, Surrey. Panel 69. Sergeant 820044, Royal Air Force (Aux. Air Force). Died Friday 27th March 1942. Age 20. Son of Walter and Eleanor Hailstone, of Manchester. Commemorated RUNNYMEDE MEMORIAL, Surrey. Panel 84. Flight Sergeant 1055985, Royal Air Force Volunteer Reserve. Pilot. Died Friday 27th March 1942. Age 21. Son of John and Elizabeth Thompson, of Halifax. Commemorated on RUNNYMEDE MEMORIAL, Surrey. Panel 76. Pilot Officer 67703, Royal Air Force Volunteer Reserve. Died Friday 27th March 1942. Commemorated RUNNYMEDE MEMORIAL, Surrey. Panel 72. Sergeant 1334807, Royal Air Force Volunteer Reserve. Died Friday 27th March 1942. Buried in BERGEN-OP-ZOOM WAR CEMETERY, Noord-Brabant, Netherlands. Grave 32. A. 5. Struck a hill in fog at Kreuth, south of Munich. Operation WHISKEY, Austria. The night of 20th April 1942 saw such bad weather, that all other RAF Bomber Command flights were cancelled, but Wing Commander Farley had to order the Polish air crew to make that agent drop flight. To his eternal credit, Wing Commander Farley decided he could not ask them to fly on such a night unless he accompanied them. As such he flew as 2nd pilot, with Captain Ryszard Zygmuntowicz acting as 1st pilot. The token parts of RAF Halifax V9976 of 138 Squadron have (in June 2005) been brought down from the summit ridge of the Blauberg mountain in Germany - read all about this on Steve Harris's web pages. Wing Commander 29089, Royal Air Force. Pilot. 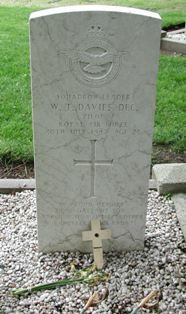 Died Tuesday 21st April 1942. Age 38. Son of Thomas Alfred and Sarah Ann Farley; husband of Maisie Selina Peta Farley, of Knightsbridge, London. Awarded the Distinguished Flying Cross (DFC). Buried in DURNBACH WAR CEMETERY, Bad Tolz, Bayern, Germany. Collective grave 9. H. 20-24. Flight Sergeant P-793737, Polish Air Force. Age 22. Buried in DURNBACH WAR CEMETERY, Bad Tolz, Bayern, Germany. Collective grave 9. H. 20-24. Sergeant P-780118, Polish Air Force. Age 34. Buried in DURNBACH WAR CEMETERY, Bad Tolz, Bayern, Germany. Collective grave 9. H. 20-24. Flying Officer 78688, Royal Air Force Volunteer Reserve. Air Gnr. Died Tuesday 21st April 1942. Buried in DURNBACH WAR CEMETERY, Bad Tolz, Bayern, Germany. Collective grave 9. H. 20-24. Agent, Peoples Commissariat for Internal Affairs (NKVD). Flight Lieutenant P-76802, Polish Air Force. Age 31. Buried in DURNBACH WAR CEMETERY, Bad Tolz, Bayern, Germany. Collective grave 9. H. 20-24. Sergeant P-781191, Polish Air Force. Age 28. Buried in DURNBACH WAR CEMETERY, Bad Tolz, Bayern, Germany. Collective grave 9. H. 20-24. Sergeant P-780095, Polish Air Force. Age 26. Buried in DURNBACH WAR CEMETERY, Bad Tolz, Bayern, Germany. Collective grave 9. H. 20-24. Flying Officer P-0291, Polish Air Force. Age 26. Buried in DURNBACH WAR CEMETERY, Bad Tolz, Bayern, Germany. Collective grave 9. H. 20-24. 'Nickling' over St. Etienne area of France. Diverted to Boscombe Down and en-route struck high ground at Porton, Wiltshire. Sergeant 1304727, Royal Air Force Volunteer Reserve. W.Op./Air Gnr. Died on Tuesday 21st April 1942. Age 21. Son of Sydney William and Laura Gertrude Leigh, of Poplar; husband of Elizabeth Leigh, of Poplar. Buried in CITY OF LONDON AND TOWER HAMLETS CEMETERY, London. Commemorated on Screen Wall. Flight Sergeant R/72363, Royal Canandian Air Force. Air Obs. 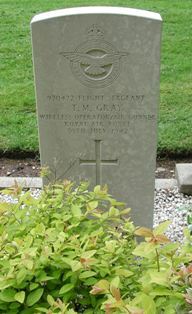 Died on Tuesday 21st April 1942. Buried in BROOKWOOD MILITARY CEMETERY, Surrey. Grave 36. I. 4. Pilot Officer J/15213, Royal Canadian Air Force. Pilot. Died Tuesday 21st April 1942. Age 29. Son of Archie Cleveland Miller and Annie Maude Miller, of Victoria, British Columbia, Canada. 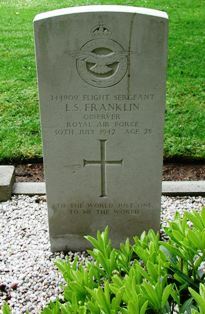 Buried in BROOKWOOD MILITARY CEMETERY, Surrey. Grave 36. I. 3. Sergeant (Pilot) 1313191, Royal Air Force Volunteer Reserve. Died Tuesday 21st April 1942. Age 19. Son of Faithful and Florrie Shaddick, of Westford. Buried in WELLINGTON CEMETERY, Somerset. Div. 1. Grave 2913. Crashed a Vire, while bombing Cholet, France. Flight Sergeant 1166741, Royal Air Force Volunteer Reserve. Pilot. Died Sunday 26th July 1942. Age 21. Son of John and Louisa Owen, of Wolverhampton. Buried VIRE NEW COMMUNAL CEMETERY, Calvados, France. Plot L. Grave 2. Flight Sergeant 649532, Royal Air Force. W.Op./Air Gnr. Died Sunday 26th July 1942. Age 23. Son of George and Elizabeth Mary Rock, of Broughshane, Co. Antrim, Northern Ireland. Buried VIRE NEW COMMUNAL CEMETERY, Calvados, France. Plot L. Grave 1. Sergeant 1055021, Royal Air Force Volunteer Reserve. Died Sunday 26th July 1942. Age 23. Son of Thomas and Margaret Thornton; husband of Elsie Thornton, of Bradford, Yorkshire. Buried VIRE NEW COMMUNAL CEMETERY, Calvados, France. Plot L. Grave 3. Sergeant 1072964, Royal Air Force Volunteer Reserve. Obs. Died Sunday 26th July 1942. Age 28. Son of Thomas and Jane Whalley, of Preston, Lancashire; husband of Edith Whalley, of Preston. Buried VIRE NEW COMMUNAL CEMETERY, Calvados, France. Plot L. Grave 4. Operation LETTUCE 5, Holland. Shot down by night-fighter while running up to target. Sqadron Leader 42204, Royal Air Force. Pilot. Died Thursday 30th July 1942. Age 23. Son of Alfred and Mabel Anne Davies, of Chester. Awarded the Distinguished Flying Cross (DFC). Buried HOLTEN GENERAL CEMETERY, Overijssel, Netherlands. Plot XV. Grave 7. Flight Sergeant 744909, Royal Air Force Volunteer Reserve. Died Thursday 30th July 1942. Age 28. Son of Tom and Elizabeth Franklin; husband of Gladys Ellen Franklin,of Southend-on-Sea, Essex. Buried HOLTEN GENERAL CEMETERY, Overijssel, Netherlands. Plot XV. Grave 5. Flight Sergeant 970472, Royal Air Force Volunteer Reserve. W.Op./Air Gnr. Died Thursday 30th July 1942. Buried HOLTEN GENERAL CEMETERY, Overijssel, Netherlands. Plot XV. Grave 3. Sergeant 927015, Royal Air Force Volunteer Reserve. W.Op./Air Gnr. Died Thursday 30th July 1942. Age 21. 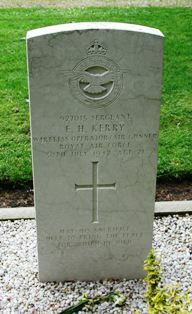 Son of Edward Kerry,and of Edith Emily Kerry, of Filkins, Oxfordshire. Buried HOLTEN GENERAL CEMETERY, Overijssel, Netherlands. Plot XV. Grave 4. Sergeant 1378512, Royal Air Force Volunteer Reserve. Died Thursday 30th July 1942. Age 24. 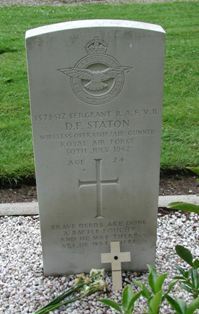 Son of Stanley Staton, and of Edith Jane Staton, of Gidea Park, Romford, Essex, husband of Dorothy P. Staton. Buried HOLTEN GENERAL CEMETERY, Overijssel, Netherlands. Plot XV. Grave 2. Sergeant 960409, Royal Air Force Volunteer Reserve. Died Thursday 30th July 1942. Age 22. Son of Phillip John Wright and of Daisy Blanche Wright (nee Leggett), of Ovington, Norfolk. Buried HOLTEN GENERAL CEMETERY, Overijssel, Netherlands. Plot XV. Grave 1. Sergeant 1215744, Royal Air Force Volunteer Reserve. Air Gnr. Died Thursday 30th July 1942. Age 20. Son of Bernard and Eleanor Wood, of Halifax. Buried HOLTEN GENERAL CEMETERY, Overijssel, Netherlands. Plot XV. Grave 6. Sergeant 1148934, Royal Air Force Volunteer Reserve. W.Op./Air Gnr. Died Sunday 20th September 1942. Buried in BOULOGNE EASTERN CEMETERY, Pas de Calais, France. Plot 12. Row D. Collective Grave 17-22. Sergeant 1177071, Royal Air Force Volunteer Reserve. W.Op./Air Gnr. Died Sunday 20th September 1942. Age 29. Husband of Bessie Rachel Pateman, of Hackney, London. Buried in BOULOGNE EASTERN CEMETERY, Pas de Calais, France. Plot 12. Row D. Collective Grave 17-22. Flight Sergeant (Pilot) R/86838, Royal Canadian Air Force. Died Sunday 20th September 1942. Age 26. Son of Ronald John and Jeannetta Fair Macdonald, of Edmonton, Alberta, Canada. Buried in BOULOGNE EASTERN CEMETERY, Pas de Calais, France. Plot 12. Row D. Collective Grave 17-22. Pilot Officer 126506, Royal Air Force Volunteer Reserve. W.Op./Air Gnr. Died Sunday 20th September 1942. Age 19. Son of Robert Charles and irene Elsie Symonds, of Chiswick, Middlesex. Buried in BOULOGNE EASTERN CEMETERY, Pas de Calais, France. Plot 12. Row D. Collective Grave 17-22. Flight Sergeant 1061883, Royal Air Force Volunteer Reserve. Pilot. Died Sunday 20th September 1942. Age 20. Son of Frederic Ritchie Walls and Jessie Eva Walls, of Ayr. Buried in BOULOGNE EASTERN CEMETERY, Pas de Calais, France. Plot 12. Row D. Collective Grave 17-22. Sergeant 1293291, Royal Air Force Volunteer Reserve. Died Sunday 20th September 1942. Age 31. Son of Stephen and Lily Jane Wright; husband of Kathleen Mary Wright, of Whitehall, Bristol. Buried in BOULOGNE EASTERN CEMETERY, Pas de Calais, France. Plot 12. Row D. Collective Grave 17-22. Sergeant 1504580, Royal Air Force Volunteer Reserve. 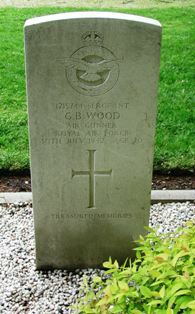 Baled out, died of wounds Friday 25th September 1942. Age 28. Son of Thomas Eden Franklin and Helen Franklin, of Roby, Lancashire. Buried in SEVIGNY-WALEPPE CHURCHYARD, Ardennes, France. Row 3. Grave 19. Flight Sergeant 979399, Royal Air Force Volunteer Reserve. Pilot. Died Sunday 27th September 1942. Buried MERVILLE COMMUNAL CEMETERY EXTENSION, Nord, France. Plot 2. Row B. Grave 15. Flight Sergeant 618327, Royal Air Force. W.Op./Air Gnr. Died Sunday 27th September 1942. Age 21. Son of Frederick George and Alice Green, of Liverpool. Buried MERVILLE COMMUNAL CEMETERY EXTENSION, Nord, France. Plot 2. Row B. Grave 6. Flight Sergeant (Pilot) 1290931, Royal Air Force Volunteer Reserve. Died Sunday 27th September 1942. Age 19. Son of Edmund James Hayhoe, D.C.M., and Lillian Hayhoe, of Harrow Weald, Middlesex. Buried MERVILLE COMMUNAL CEMETERY EXTENSION, Nord, France. Plot 2. Row B. Grave 7. Developed engine trouble, aircraft forced to ditch off the Dutch coast. Operation LETTUCE 7. Sergeant 1320955, Royal Air Force Volunteer Reserve. Died Friday 2nd October 1942. Age 20. Son of Amos and Margret Gander, of Brighton, Sussex. Commemorated RUNNYMEDE MEMORIAL, Surrey. Panel 83. Sergeant 1160931, Royal Air Force Volunteer Reserve. Died Monday 5th October 1942. Age 22. Son of Herbert G. and Alice F. Harbridge, of Fulham, London. Commemorated RUNNYMEDE MEMORIAL, Surrey. Panel 85. Pilot Officer 49684, Royal Air Force. Died Friday 2nd October 1942. Age 23. Son of Gilbert Leslie and Elsie Kite; husband of Dorothy Kite. Commemorated RUNNYMEDE MEMORIAL, Surrey. Panel 70. Sergeant 1388136, Royal Air Force Volunteer Reserve. Died Friday 2nd October 1942. Age 21. Son of George Burfield Scott and Gertrude Anne Scott, of Chipstead, Surrey. Commemorated RUNNYMEDE MEMORIAL, Surrey. Panel 93. Crashed at base. Operation LUCKYSHOT 8, Belgium. Pilot Officer 125723, Royal Air Force Volunteer Reserve. Pilot. Died Thursday 22nd October 1942. Age 22. Son of Walter George and Gertrude Eva Smith, of Dovercourt. Awarded the Distinguished Flying Cross. Buried in HARWICH CEMETERY, Essex. Consecrated Sec. Grave 3328. Crashed in southern Norway. Operation PLIERS, Poland. Sergeant P-784220, Polish Air Force. Age 33. Buried in EGERSUND CEMETERY, NORWAY. Collective grave 11-B-8. Flight Sergeant P-780189, Polish Air Force. Age 23. Buried in EGERSUND CEMETERY, NORWAY. Collective grave 11-B-8. Pilot Officer P-1571, Polish Air Force. Age 24. Buried in EGERSUND CEMETERY, NORWAY. Collective grave 11-B-8. Flight Sergeant P-780420, Polish Air Force. Age 28. Buried in EGERSUND CEMETERY, NORWAY. Collective grave 11-B-8. Flying Officer P-76627, Polish Air Force. Age 27. Awarded the Distinguished Flying Cross. Buried in EGERSUND CEMETERY, NORWAY. Collective grave 11-B-8. Warrant Officer P-780216, Polish Air Force. Age 28. Pilot. Buried in EGERSUND CEMETERY, NORWAY. Collective grave 11-B-8. Flight Sergeant P-793039, Polish Air Force. Age 21. Buried in EGERSUND CEMETERY, NORWAY. Collective grave 11-B-8. Three Polish agents were also killed but are not named. Vestre Gravlund (Western Cemetery) in Oslo in a common grave with 24 other Polish citizens. Crashed in France. Operation PRODUCER 2, France. Sergeant 758119, Royal Air Force Volunteer Reserve. Air Gnr. Died Sunday 1st November 1942. Age 21. Son of Vernon Harcourt Hallewell, and of Gertrude Alberta Colville Hallewell, of Highgate, Middlesex. Buried ABBEVILLE COMMUNAL CEMETERY, Somme, France. Plot 5. Row H. Collective Grave 22-24. Sergeant 1061605, Royal Air Force Volunteer Reserve. W.Op./Air Gnr. Died Sunday 1st November 1942. Buried ABBEVILLE COMMUNAL CEMETERY, Somme, France. Plot 5. Row H. Collective Grave 22-24. (Flight Sergeant) Warrant Officer Class II (Pilot) R/92556, Royal Canadian Air Force. Died Sunday 1st November 1942. Buried ABBEVILLE COMMUNAL CEMETERY, Somme, France. Plot 5. Row H. Collective Grave 22-24. Flying (Pilot) Officer 47365, Royal Air Force. Pilot. Died Sunday 1st November 1942. Buried ABBEVILLE COMMUNAL CEMETERY, Somme, France. Plot 5. Row F. Grave 20. Flying (Pilot) Officer 120539, Royal Air Force Volunteer Reserve. Nav. A.R.C.A. Died Sunday 1st November 1942. Age 33. Son of Percy Charles and Ethel Wheatley; husband of Betty Wheatley, of Little Baddow, Essex. Buried ABBEVILLE COMMUNAL CEMETERY, Somme, France. Plot 6. Row D. Grave 20. Sergeant 1188851, Royal Air Force Volunteer Reserve. Air Gnr. Died Sunday 1st November 1942. Buried ABBEVILLE COMMUNAL CEMETERY, Somme, France. Plot 5. Row H. Collective Grave 22-24. Presumed lost over sea. Operation PERIWIG 7, Belgium. Sergeant 1251957, Royal Air Force Volunteer Reserve. Nav./Bomber. Died Monday 23rd November 1942. Age 32. Son of John Henry and Ellen Andrews; husband of Grace Emily Maud Andrews, of Cowes, Isle of Wight. Buried BOULOGNE EASTERN CEMETERY, Pas de Calais, France. Plot 12. Row C. Grave 17. (Flight) Sergeant R/100702, Royal Canadian Air Force. Died Monday 23rd November 1942. Age 23. Son of William and Mary Elizabeth Harrison, of Mount Dennis, Ontario, Canada. Commemorated RUNNYMEDE MEMORIAL, Surrey. Panel 104. Flight Seargeant 655049, Royal Air Force. Pilot. Died Monday 23rd November 1942. Age 30. Son of E. S. Hey and Caroline M. Hey; husband of Jean F. Hey, of Fenham, Newcastle-on-Tyne. Buried BOULOGNE EASTERN CEMETERY, Pas de Calais, France. Plot 12. Row C. Grave 15. Sergeant 1109504, Royal Air Force Volunteer Reserve. Air Gnr. Died Monday 23rd November 1942. Age 20. Son of Joseph and Elizabeth Kenzie of Ellesmere Port. Buried OVERPOOL CEMETERY, ELLESMERE PORT, Cheshire. Sec. E. Grave 16. Sergeant 1113285, Royal Air Force Volunteer Reserve. W.Op./Air Gnr. A.R.V.O. Died Monday 23rd November 1942. Age 29. Son of Frank and Florence Agnes Metcalf, of Tadcaster, Yorkshire. Buried BOULOGNE EASTERN CEMETERY, Pas de Calais, France. Plot 12. Row C. Grave 16. Sergeant 913185, Royal Air Force Volunteer Reserve. Died Monday 23rd November 1942. Age 24. Son of William and Annie Moxon; husband of Jessie I. Moxon, of Highgate, Middlesex. Commemorated RUNNYMEDE MEMORIAL, Surrey. Panel 90. Went missing between Egypt and Malta. Flying Officer 101525, Royal Air Force Volunteer Reserve. Pilot. Died Thursday 10th December 1942. Awarded the Distinguished Flying Cross. Husband of G. Anderle. Native of Czechoslovakia. Commemorated on ALAMEIN MEMORIAL, Egypt. Column 247. Pilot Officer 138311, Royal Air Force Volunteer Reserve. Passenger. Died Thursday 10th December 1942. Son of Percy and Maud Chambers; husband of Marjorie Gertrude Chambers, of Cheam, Surrey. Commemorated on ALAMEIN MEMORIAL, Egypt. Column 248. Corporal 1199671, Royal Air Force Volunteer Reserve. Ground Crew. Died Thursday 10th December 1942. Age 22. Son of Samuel Edward and Sarah Ellen Chandler, of Rednal, Warwickshire. Commemorated on ALAMEIN MEMORIAL, Egypt. Column 263. Flight Sergeant 787484, Royal Air Force Volunteer Reserve. Died Thursday 10th December 1942. Native of Czechoslovakia. Commemorated on ALAMEIN MEMORIAL, Egypt. Column 249. (Corporal) Aircraftman 1st Class 1499347, Royal Air Force Volunteer Reserve. Ground Crew. Died Thursday 10th December 1942. Age 20. Son of Noah and Annie Hutchinson; husband of Nora Penrose Hutchinson, of Heanor, Derbyshire. Commemorated on ALAMEIN MEMORIAL, Egypt. Column 264. (Pilot Officer) 87622, Royal Air Force Volunteer Reserve. Died Thursday 10th December 1942. Native of Czechoslovakia. Commemorated on ALAMEIN MEMORIAL, Egypt. Column 247. Warrant Officer 787173, Royal Air Force Volunteer Reserve. Died Thursday 10th December 1942. Native of Czechoslovakia. Commemorated on ALAMEIN MEMORIAL, Egypt. Column 249. Pilot Officer 138677, Royal Air Force Volunteer Reserve. Died Thursday 10th December 1942. Native of Czechoslovakia. Commemorated on ALAMEIN MEMORIAL, Egypt. Column 249. Pilot Officer 138678, Royal Air Force Volunteer Reserve. Died Thursday 10th December 1942. Native of Czechoslovakia. Commemorated on ALAMEIN MEMORIAL, Egypt. Column 249. (Sergeant) Pilot Officer 136560, Royal Air Force Volunteer Reserve. Died Thursday 10th December 1942. Native of Czechoslovakia. Commemorated on ALAMEIN MEMORIAL, Egypt. Column 249. Crashed on take-off from Luqa, Malta bound for Gibraltar. Major 12995, 1st, Royal Gloucestershire Hussars, R.A.C. Passenger. Died Thursday 17th December 1942. Age 47. True family name BATHURST. Lord Apsley. Son of Colonel Seymour Henry Bathurst, C.M.G., T.D., J.P., D.L., 7th Earl Bathurst, and of the Countess Bathurst (nee Borthwick), of Cirencester, Gloucestershire; husband of Lady Apsley, C.B.E (nee Meeking), of Cirencester. Colonel, The Arab Legion. M.A (Oxon); J.P.; Deputy Lieutenant for the County of Gloucestershire; Member of Parliament for Southampton, 1922-1929, and Bristol, 1931-1942; President, United Kingdom Pilots' Association. He also served in the First World War 1915-1919. Awarded the Distinguished Service Order (DSO), Military Cross (MC) and Territorial Army Decoration (TD). Buried MALTA (CAPUCCINI) NAVAL CEMETERY, Malta. Leading Aricraftman 1069726, Royal Air Force Volunteer Reserve, ex 21 P.T.C. Middle East Command. Ground Crew. Died Thursday 17th December 1942. Buried MALTA (CAPUCCINI) NAVAL CEMETERY, Malta. Protestant Sec. (Men's). Plot F. Collective grave 18. Leading Aircarftman 1233498, Royal Air Force Volunteer Reserve. Ground Crew. Died Thursday 17th December 1942. Age 21. Son of Joseph and Mary Ellen Clegg, of Preston, Lancashire. Buried MALTA (CAPUCCINI) NAVAL CEMETERY, Malta. Protestant Sec. (Men's). Plot F. Collective grave 16. Flying Officer P-0100, Polish Air Force. Age 27. Pilot. Died Thursday 17th December 1942. Buried MALTA (CAPUCCINI) NAVAL CEMETERY, Malta. Collective grave 4. Flight Lieutenant 44315, Royal Air Force, ex 462 Squadron. Passenger. Observer. Died Thursday 17th December 1942. Age 28. Buried MALTA (CAPUCCINI) NAVAL CEMETERY, Malta. Protestant Sec. (Men's). Plot E. Collective grave 4. Corporal 1165159, Royal Air Force Volunteer Reserve. Ground Crew. Died Thursday 17th December 1942. Buried MALTA (CAPUCCINI) NAVAL CEMETERY, Malta. Protestant Sec. (Men's). Plot F. Collective grave 17. Flying Officer P-0742, Polish Air Force. Age 31. Died Thursday 17th December 1942. Buried MALTA (CAPUCCINI) NAVAL CEMETERY, Malta. Collective grave 4. Aircraftman 1st Class 1493201, Royal Air Force Volunteer Reserve, ex 244 Wing Middle East Command. Ground Crew. Died Thursday 17th December 1942. Age 40. Son of George and Mary Ann Kelly; husband of Alice Beatrice Kelly, of Wood Green, Middlesex. Buried MALTA (CAPUCCINI) NAVAL CEMETERY, Malta. Protestant Sec. (Men's). Plot F. Collective grave 18. Flight Sergeant P-780771, Polish Air Force. Age 25. Died Thursday 17th December 1942. Buried MALTA (CAPUCCINI) NAVAL CEMETERY, Malta. Collective grave 4. Major, Indian Army. Passenger. Died Thursday 17th December 1942. Age 38. Buried MALTA (CAPUCCINI) NAVAL CEMETERY, Malta. Protestant Sec. (Men's). Plot E. Collective Grave 4. Flying Officer P-0858, Polish Air Force. Age 27. Died Thursday 17th December 1942. Buried MALTA (CAPUCCINI) NAVAL CEMETERY, Malta. Collective grave 4. Sergeant 535526, Royal Air Force. Ground Crew. Died Thursday 17th December 1942. Buried MALTA (CAPUCCINI) NAVAL CEMETERY, Malta. Protestant Sec. (Men's). Plot F. Collective grave 17. Flight Lieutenant 78666, Royal Air Force Volunteer Reserve, ex 40 Sqdn. Passenger. Air Gnr. Died Thursday 17th December 1942. Age 42. Son of Thomas and Elizabeth Vaughan; husband of Joan Vaughan, of Epsom, Surrey. Awarded the Distinguished Flying Cross (DFC) and the Distinguished Service Order (DSO). Buried MALTA (CAPUCCINI) NAVAL CEMETERY, Malta. Protestant Sec. (Men's). Plot E. Collective Grave 4. Sergeant 571759, Royal Air Force. Flt. Engr. Died Thursday 17th December 1942. Age 21. Grandson of Isabella Watt, of St. Fergus, Aberdeenshire. Buried MALTA (CAPUCCINI) NAVAL CEMETERY, Malta. Protestant Sec. (Men's). Plot F. Collective grave 17. [Spelt WEDGEWOOD in some sources] Squadron Leader 37645, Royal Air Force, ex 92 Squadron. Passenger. Pilot. Died Thursday 17th December 1942. Awarded the Distinguished Flying Cross (DFC). Buried MALTA (CAPUCCINI) NAVAL CEMETERY, Malta. Protestant Sec. (Men's). Plot E. Collective Grave 4. Sergeant P-780214, Polish Air Force. Age 27. Died Thursday 17th December 1942. Buried MALTA (CAPUCCINI) NAVAL CEMETERY, Malta. Collective grave 18. Flight Sergeant P-781151, Polish Air Force. Age 33. Died Thursday 17th December 1942. Buried MALTA (CAPUCCINI) NAVAL CEMETERY, Malta. Collective grave 16. Crashed near Meppel. Operation MARROW 12, Holland. Flying Officer 108998, Royal Air Force Volunteer Reserve. Pilot. Died on Wednesday 23rd December 1942. Age 20. Awarded the Distinguished Flying Cross (DFC). Son of Lt.-Col. Francis Benton Newport Tinley, M.C., Indian Army, and Cicely Sophia Newport Tinley. Buried STAPHORST (IJHORST) GENERAL CEMETERY, Overijssel, Netherlands. Grave 6. Sergeant 1194506, Royal Air Force Volunteer Reserve. Died on Wednesday 23rd December 1942. Age 21. Son of Ben and Lizzie Robinson Pick, of Benson, Oxfordshire. Buried STAPHORST (IJHORST) GENERAL CEMETERY, Overijssel, Netherlands. Grave 3. Sergeant 1252825, Royal Air Force Volunteer Reserve. Flight Engineer. Died on Wednesday 23rd December 1942. Age 31. Son of Thomas Stearman and Norah Nixon. Husband of S. E. Nixon, of Feltham, Middlesex. Buried STAPHORST (IJHORST) GENERAL CEMETERY, Overijssel, Netherlands. Grave 5. Warrant Officer 580998, Royal Air Force. Nav./Bomber. Died on Wednesday 23rd December 1942. Awarded the Distinguished Flying Cross (DFC). Buried STAPHORST (IJHORST) GENERAL CEMETERY, Overijssel, Netherlands. Grave 2. Flight Sergeant 624640, Royal Air Force. W.Op./Air Gnr. Died on Wednesday 23rd December 1942. Age 23. Son of Charles George and Elizabeth Anne Taylor; husband of Daisy Pearl Taylor, of Lewes, Sussex. Buried STAPHORST (IJHORST) GENERAL CEMETERY, Overijssel, Netherlands. Grave 1. Sergeant 1331642, Royal Air Force Volunteer Reserve. Died on Wednesday 23rd December 1942. Age 21. Son of Clifford and Rose Pretoria Hayes, of Hove, Sussex. Buried STAPHORST (IJHORST) GENERAL CEMETERY, Overijssel, Netherlands. Grave 4. The crew listed below were originally credited here as having been based at Tempsford which was incorrect. The crew were actually baseds at RAF Stradishall in Suffolk; 138 Squadron moved to Tempsford two days later. Crashed taking off for French operation FRENSHAM. Sergeant 787826, Royal Air Force Volunteer Reserve. Died Tuesday 10th March 1942. Age 21. Citizen of Czechoslovakia. Buried in HAVERHILL CEMETERY, Suffolk. Sec. U. Grave 192. Sergeant 787577, Royal Air Force Volunteer Reserve. Died Tuesday 10th March 1942. Age 23. Citizen of Czechoslovakia. Buried in HAVERHILL CEMETERY, Suffolk. Sec. U. Grave 193. Flying Officer 61918, Royal Air Force Volunteer Reserve. Died Tuesday 10th March 1942. Age 26. Citizen of Czechoslovakia. Buried in HAVERHILL CEMETERY, Suffolk. Sec. U. Grave 243. Sergeant 787688, Royal Air Force Volunteer Reserve. Died Tuesday 10th March 1942. Age 22. Repatriated to Czechoslovakia (cremated at Cambridge Crematorium). Commemorated in REPATRIATION REGISTER, Civilian War Dead. Squadron Leader 39150, Royal Air Force. Pilot. Died Tuesday 10th March 1942. Age 27. Son of Theodore Romanoff (of Russian origins), and of Evelyn M. Romanoff (nee Cattley), of West Ealing. Educated at Berkhamstead Scholl. Joined RAF in 1936. Wakefield Trophy Gold Medallist for Boxing 1936. Commemorated HENDON CREMATORIUM, Middlesex. Panel 5.